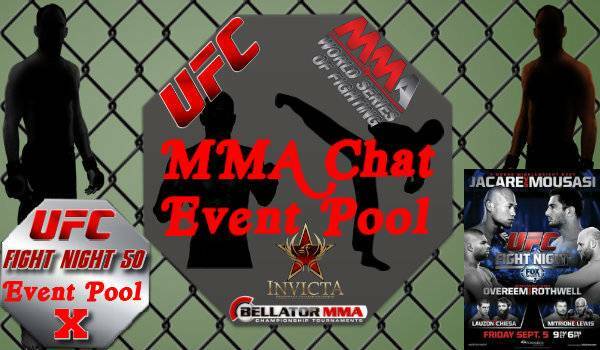 Fight picks must be entered in this thread by September 5, 2014 no later than 9:00 pm East Coast Time... one of the Mods will update the 1st post to log each player's picks. Still a couple of hours to get your picks in for anybody interested. The prelims are about to get underway. Making this one 20-18 Skelly going into the final round. We should get rid of the live event section since we discuss it here. Better discussing it here anyways. Wow... Skelly looks exhausted ! I'll probably hide that forum until we get more active members willing to discuss the live events. This guy Skelly is amazing on the ground... submission attempt after submission attempt ! Making this one 30-27 Skelly on my scorecard.